Linfox has officially signed off on its new union-negotiated enterprise agreement that guarantees wage and superannuation increases, as CEO Michael Byrne backs the call for safe rates. 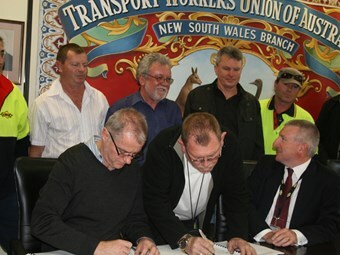 In a ceremony late last week in Sydney, Transport Workers Union (TWU) officials and Linfox representatives inked the deal which Fair Work Australia approved in May. Drivers will receive a 12 percent wage increase over three years, along with annual 1 percent increases to superannuation over the life of the agreement. Linfox has committed to increasing superannuation annually until it reaches 15 percent and to make casual workers permanent after six months. Byrne says the agreement will deliver a secure retirement for employees and certainty in the short-term. "We know our employees work hard, invest in our company through their commitment and this is one way the company can assist to see they are looked after in retirement," he says. "But we would like to see the same commitment throughout the road transport industry, and we support the introduction of safe rates." The TWU is currently waging a fierce campaign to get the Federal Government to reform trucking remuneration. It wants a tribunal with the power to set pay rates for different sectors of the industry and various vehicle combinations. "The link between rates of pay and safety is clear – whenever truck drivers are not getting full cost recovery, including paid waiting times or full fuel reimbursement, they are going to be pushed to make a living. We need a system of safe rates in this country and we need it now," TWU National Secretary Tony Sheldon says. He last month launched a broadside against Workplace Relations Minister Chris Evans for so far failing to legislate safe rates. Industry support for the scheme is divided, with employer associations such as NatRoad, the Australian Logistics Council and the South Australian Road Transport Association opposing the union’s campaign. NatRoad has instead called for mandatory paid waiting times, while the ALC favours a self-regulatory approach such as a code of conduct.